Feeling the holiday mood? 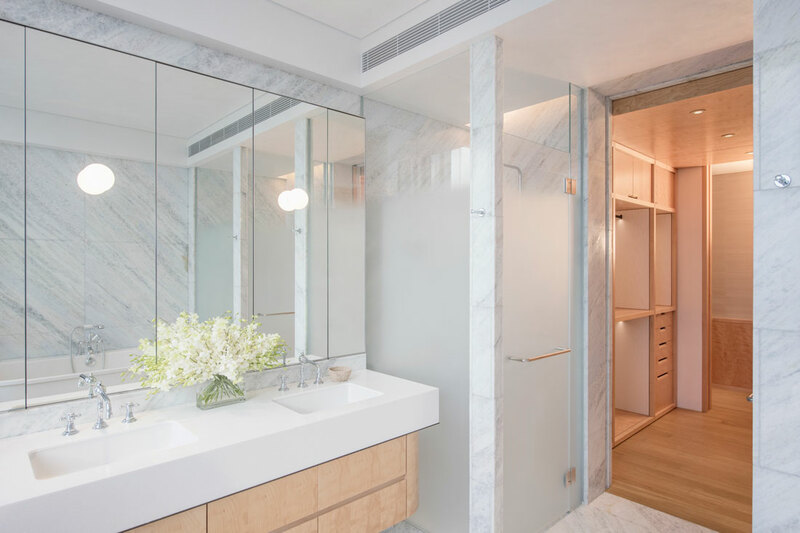 This vacation apartment at Jean Nouvel’s Le Nouvel Ardmore condominium was designed to emulate the light, airy atmosphere outside its 28th-storey windows. 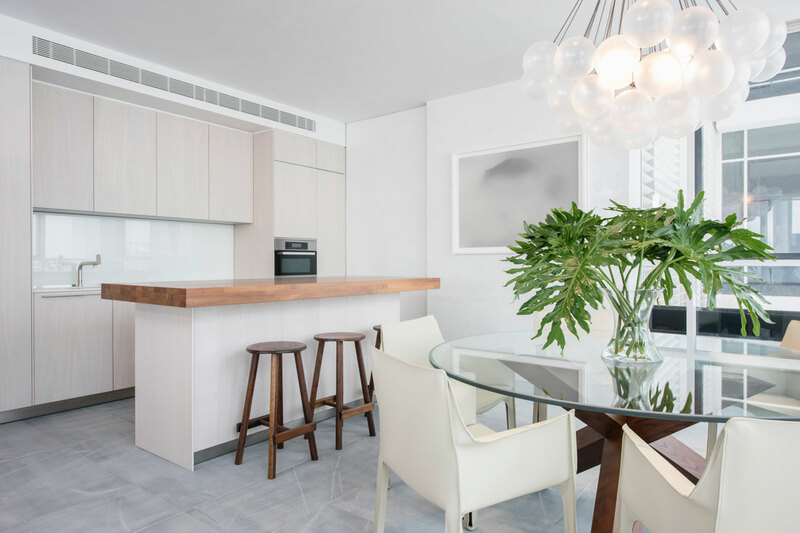 Le Nouvel Ardmore is a residential tower close to Singapore’s central shopping district. True to the French Pritzker Architecture Prize-winning architect Jean Nouvel’s modern, expressive style, the architecture features a bold, gridded facade with floor-to-ceiling windows allowing unblocked vistas. 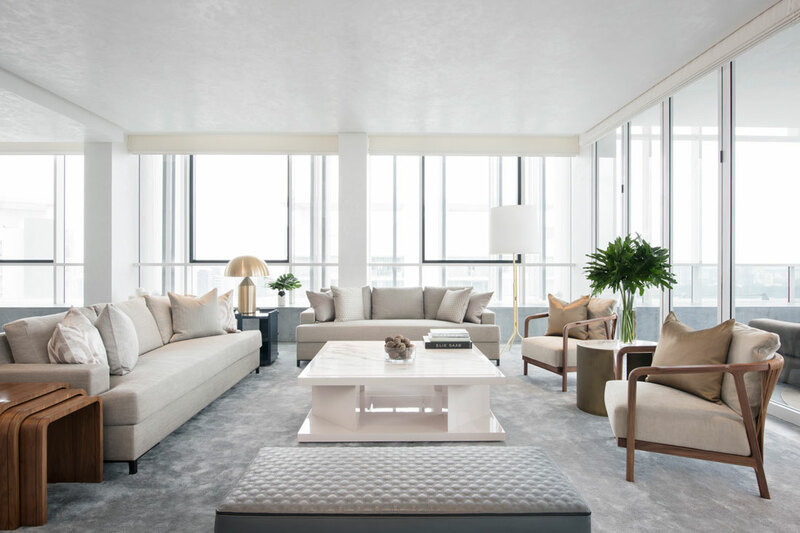 Brewin Design Office was commissioned to design the interior of an apartment there as a vacation home for an overseas-based client. Situated on the 28th storey of the 33-storey tower, the scenery is very much azure sky and soft clouds all around. This provided the inspiration for the recurring theme of nature within. 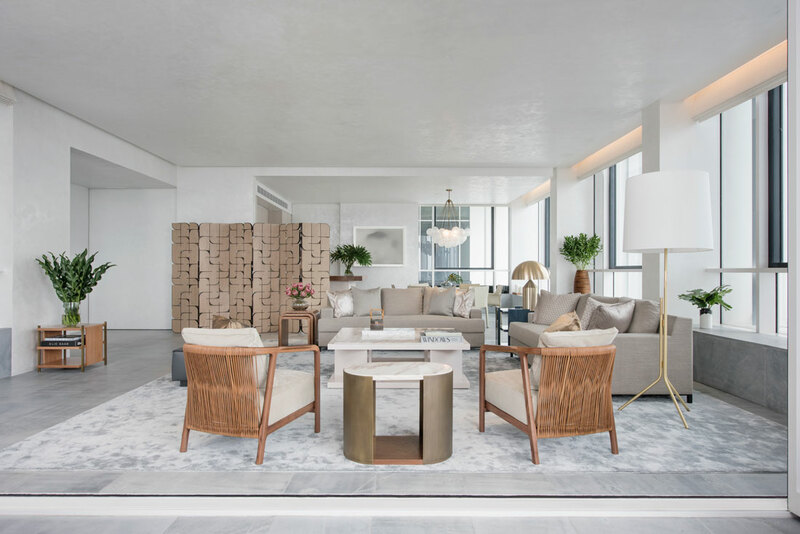 As such, one encounters a living room whose Prussian Grey marble flooring aims to mimic the colour of the sky, providing a seamless inside-outside connection. 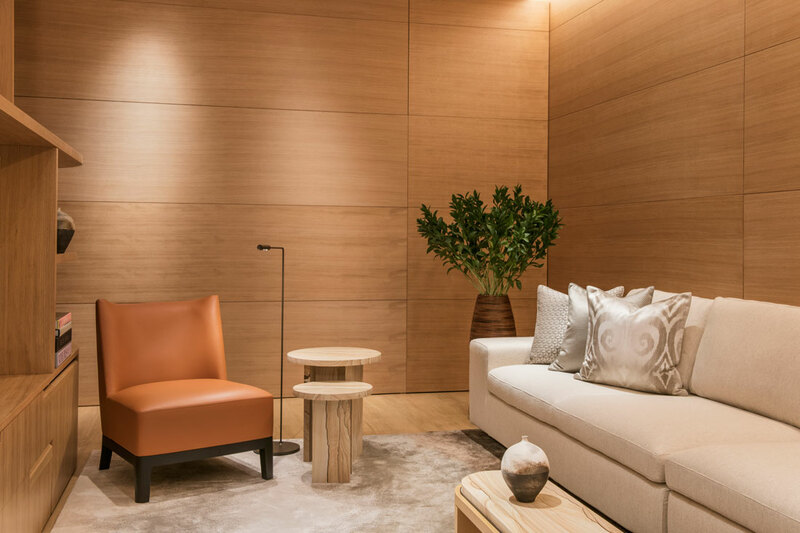 Matched by furniture such as a dusty grey Christian Liaigre sofa and the warm timbers of a Poliform armchair and custom-designed side tables, the overall mood is calm and genteel – fitting for the cultivation of restful minds. Adding a graphic touch is a custom-designed screen made from bent-laminated Wenge veneer strips and figured maple veneer panels subtly shielding the kitchen from the living room. 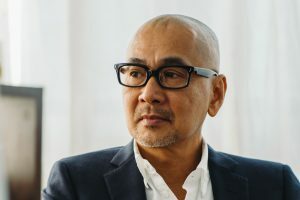 “[The client] was in love with the high storey and unobstructed view, also the dusk colours… the evening sky at [the later part] of year is almost typically light blue grey, which she wanted her apartment to emulate,” shares Bobby Cheng, the firm’s founder and the project’s lead designer. Much consideration went into the selection of materials, he adds. For instance, the decision to finely sandblast then seal, rather than hone, the living room marble, created the specific blue grey desired. The rest of the apartment follows a similarly relaxed feel, with the recurring theme of connecting with the sky. Walls and ceilings, excluding the bathrooms, are finished in a silvery white stucco with a subtle tint of blue. In the dining room, the Cloud pendant by Apparatus Studio, as its name suggests, references the views in a playful way. 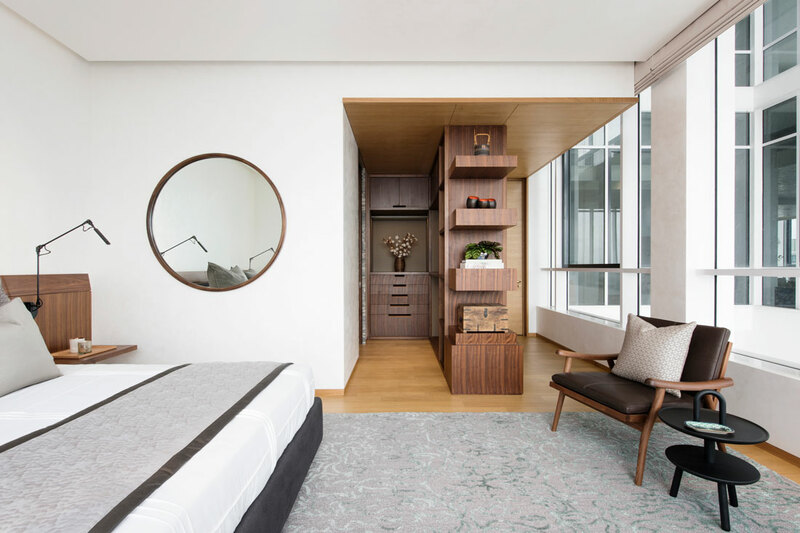 The bedrooms and family room are wrapped in an assortment of timbers, as well as marble inserts applied to side tables and wardrobe panels that lend the spaces a touch of luxe. 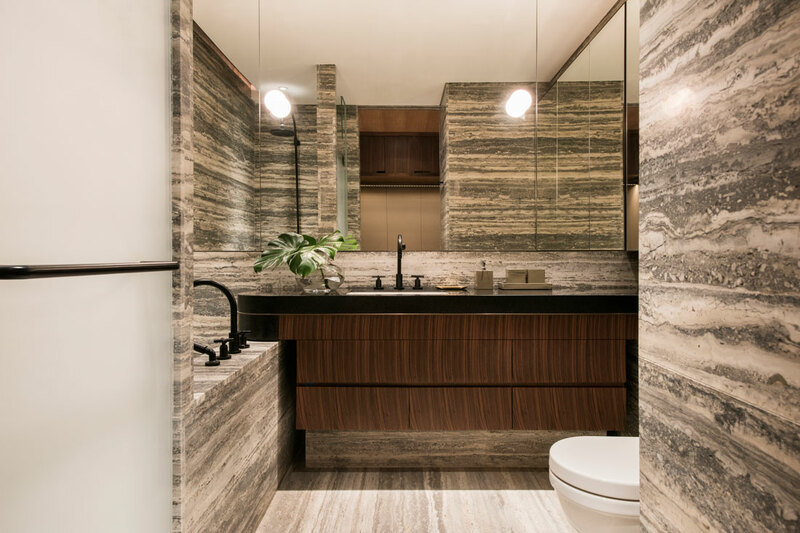 This feeling is writ large in the bathrooms, which are entirely clad in stone – darker Ocean Black Travertine in one bathroom and expansive Brazilian Crystal Blue Quartzite marble in the master bedroom bathroom. 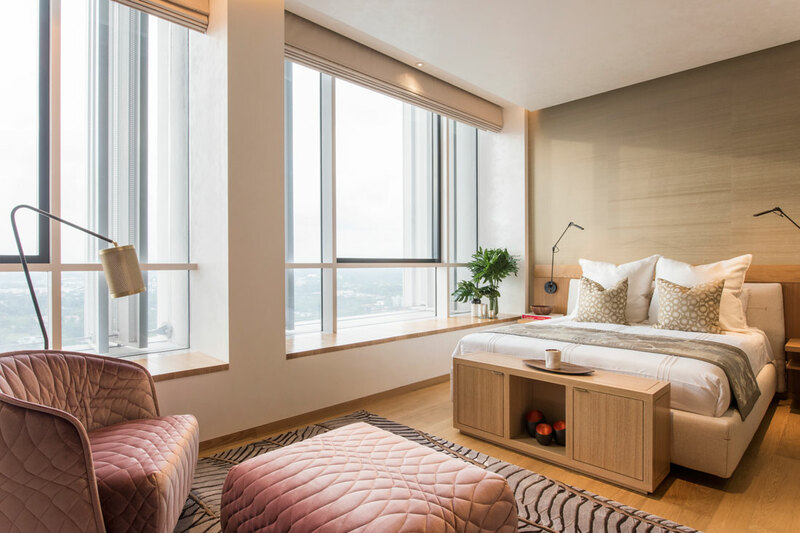 Throughout, Cheng has managed to create a refined sense of calm without falling prey to sterility, and also injected points of interest without excess of flourish. The formula is in an appropriate mix of unique materials, thoughtful detailing and sophisticated execution that stays true to its empyrean narrative. Photography courtesy of Brewin Design Office. On 7 March, Bill Bensley will be recognised for his incomparable contributions to the hospitality industry during the AHEAD Asia 2019 ceremony in Singapore. 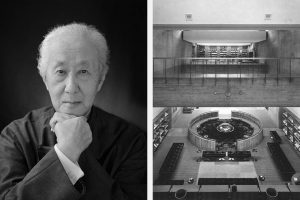 Lauded as a visionary and a pioneer in facilitating the dialogue between East and West, distinguished Japanese architect Arata Isozaki has been named the Pritzker Prize Laureate 2019.